What do we can offer to you? Welcome to Nordrhein-Bus, the leading bus service in the area of Düsseldorf, Köln, Aachen, Essen, Kleve, and the western part of the State of North Rhine-Westphalia. 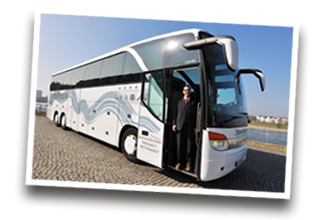 We would like to introduce ourselves to you as your partner for bus and coach rental. 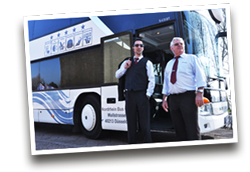 We can offer you every kind of bus transfer, with modern bus vehicles carrying 7 to 79 people. Our large fleet of buses includes minibuses, VIP shuttle coaches, and modern long distance coaches with 7-79 seats, with many comfort features. 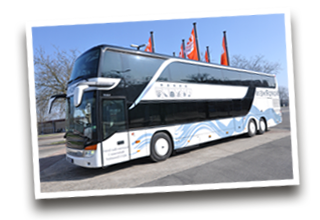 We can offer you bus and coach charter travel opportunities in the North Rhine-Westphalia region with nearby destinations such as Dortmund, Eifel, Lower Rhine, Muensterland, Westerwald, and Saarland. We are also the right European charter partner for you for nationwide coach travel to destinations such as Hamburg, Berlin, Munich and Frankfurt, as well as international coach destinations like London, Paris, Brussels, Amsterdam, Maastricht, Luxembourg, Rome, Warsaw, Copenhagen, Madrid, Vienna and Zurich. Our services include business transfers, trade fair transfers, conference shuttle services, VIP transfer services, airport transfers, incentives, cruise ship shuttle services and much more. We gladly handle any group, and groups of any size; business managers, VIPs, students, athletes, clubs, fans, holiday-makers and any other group. We would be pleased to provide you with a quote for return trips, one-way trips, transfers, or multi-day tours for one or more days with or without hotel accommodation. If you have a request for a particular programme, whether within the region or for tours at home or abroad, we can on request prepare a quote for your bus and coach travel with attractive and advantageous prices. You can reach our staff with your enquiries and requests by telephone or email from Monday to Friday from 9.00 to 12.00 and from 14.00 to 16.30. Outside of these office hours you can contact us through our homepage. You can request a bus and coach proposal online, or find useful information about the various destinations. In addition you will also find details of our high safety standards, our vehicles and drivers, as well as our concept of quality. We would be pleased for you to come to one of our branches in Essen, Kleve or Aachen. We look forward to welcoming you soon on board one of our buses and coaches. Best regards from Dusseldorf on the Rhine. The company Nordrhein Reise und Bus Service GmbH operates a bus service. According to the provisions of the law every passenger using regular and excursion services must have a valid single ticket for the service required, every travel group must have a valid group ticket before setting off on the trip. For regular services the ticket corresponds with the appropriate standards of the respective integrated public transport system or with the tickets required for the routes serviced, which are usual for the provision of the public passenger service in this region. For excursion services the order confirmation serves as a valid group or single ticket provided the invoice has been settled. The passenger fare is determined by Nordrhein Reise uns Bus-Service GmbH before the journey and is due 10 days before setting out. Nordrhein Reise Bus GmbH reserves the right to ask for an advance payment for initial orders or if the credit standing is not sufficient, if necessary. Public organisations can generally settle their invoice within 5 days after the journey. The amount is due after invoicing within the credit term indicated payable to the bank account of Nordrhein Reise und Bus-Service GmbH. The fare is calculated on the basis of our company tariff as follows: for day trips up to ten hours on an hourly basis, for more than ten hours as several-day trips on a daily basis at an hourly service per day of up to 20 kilometres an hour up to a maximum of 10 hours per day. The customer shall receive a respective quotation and, after placing the order, an order confirmation which serves as a ticket. The price quoted in the quotation includes the services mentioned irrespective of any previous agreements. Any additional kilometres driven or extra hours are invoiced at a rate of EUR50.00 per part of an hour or EUR1.55 per part of an additional kilometre unless explicitly agreed otherwise in the order. Any road, ferry, pass and tunnel tolls incurred by Nordrhein Reise und Bus-Service GmbH in addition to the fare shall be booked by the customer and paid directly to the respective service provider. If necessary, the respective cost for transportation by ferry and alike for the vehicle and the crew shall be paid directly by the customer to the service provider or shall be arranged for or booked directly by the customer provided this is required for the trip. If the company Nordrhein Reise und Bus-Service GmbH makes any advance payments in this context, a transaction fee of 10 per cent or a minimum of EUR50.00 shall be invoiced for each transaction. The company is not obliged convey passengers or goods unless the provisions of the Terms of Business are fully complied with. Any deviations from the routes, breakdowns, interruptions of service of all kinds beyond the control of Nordrhein Reise und Bus-Service GmbH shall not constitute any liability for damages of Nordrhein Reise und Bus-Service GmbH towards the customer. 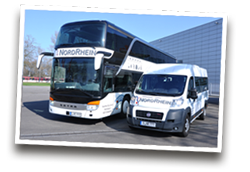 In case Nordrhein Reise und Bus-Service GmbH is responsible for breakdowns or interruptions Nordrhein Reise und Bus-Service GmbH shall be liable up to the total of the fare it receives or has received for the route not serviced. Hiring of a replacement vehicle required the previous consent of Nordrhein Reise und Bus-Service GmbH by phone. Otherwise the claim for indemnification by Nordrhein Reise und Bus-Service GmbH shall expire. When a firm order is cancelled, please note that up to 20 days before the scheduled trip 10 per cent of the fare, 20 days before the scheduled trip 50 per cent and up to tree days before the scheduled trip 80 per cent of the fare are due. For cancellations of ancillary services or advance payments the cancellation fees of the service provider plus an additional fee of 10 per cent shall be charged. Upon request we can inform ourselves and pass on the applicable cancellation provisions of the service provider. The passengers shall comply with the instructions of the on-board staff to ensure traffic safety. Passengers disregarding the instructions of the on-board staff, drunken passengers and those molesting other passengers can be excluded from transport. These passengers are not entitled to any reimbursement of the fare. The operation of the radio or the loudspeakers, the kitchen, the lavatory, the refrigerator and the components pertaining to the AC unit as well as the roof and outside windows is the task of the driver or the person authorized by the driver. Any cost incurred due of damage to or soiling of the vehicles or other operating facilities shall be reimbursed. In addition to the passengers the customer shall also be liable for any damage caused by the passengers. Passengers having missed the agreed departure times cannot make any claims for compensation or reimbursement of the fare. Any children taken along must be supervised by a person named by the customer. This person as well as the legal representatives of the children as well as customer are jointly liable for any damage caused as a consequence of insufficient supervision of the children. Luggage is transported at the normal extend (1 suitcase per person). Any luggage kept in the passenger or luggage compartment of the vehicle must be supervised by the passenger. Nordrhein Reise und Bus-Service GmbH shall not be liable for any damage or mix-up of luggage. Nordrhein Reise und Bus-Service GmbH shall only be liable for damage if the company is at fault. Maximum liability amounts to EUR1,000.00. We strongly recommend taking out luggage insurance. Any liability of Nordrhein Reise und Bus-Service GmbH for wardrobe, valuables or luggage left behind on the bus is expressly excluded. The transportation of animals is excluded unless it has been expressly approved by Nordrhein Reise und Bus-Service GmbH. In such a case any animals taken along must be supervised by the passenger and may only be transported if the legal provisions are complied with (if required, muzzle etc.). The customer shall also be liable for soiling or injuries caused by the animal. After having taken their seats all passengers are required to fasten their seat belts and to permanently ensure a firm grip whenever leaving the seat or standing, in particular when close to the doors so that they can neither suffer injuries themselves nor injure others. Any damage caused due to disregard of these precautionary measures shall be borne by the person concerned. If the seats are equipped with seat belts these must be fastened while the bus is driving. Nordrhein Reise und Bus-Service GmbH shall not be liable for any consequential damage arising when these obligations are not met. With respect to the arrival time at the destination or the departure time Nordrhein Reise und Bus-Service GmbH shall not be liable for any delays or the calculation of the estimated travel time. Any of these details are non-binding unless agreed otherwise. The driver must be available again for Nordrhein Reise und Bus-Service GmbH at the time indicated orally or printed on the order / ticket. Should the customer ask the driver for time changes to carry out the order in particular if the customer intends to use the vehicles longer than planned, Nordrhein Reise und Bus-Service GmbH must be contacted in advance to check whether these changes are possible. If such an inquiry is not possible, the driver must start the return trip at the time agreed on in the transportation contract in order to be able to carry out the tasks assigned to him or to comply with the labour and social-law regulations. In case the customer and Nordrhein Reise und Bus-Service GmbH agree on an extension of the order the customer is obliged to legibly confirm on the ticket /instruction form of the driver with his signature and name (in print) that he will fully bear any additional cost incurred for the trip. A signature as stated in a./ shall also be provided when additional services are asked for during normal transportation, which do not have any impact on the departure and arrival time of the order. Cancellations, shortenings etc. shall not constitute a price reduction if Nordrhein Reise und Bus-Service GmbH is not a fault. Should the company be at fault, the liability provisions and the maximum liability in the terms of business shall apply. These are outlined in the paragraph below. Insurance of the passenger is provided by the statutory third-party liability insurance of Nordrhein- Bus GmbH. Nordrhein Reise und Bus-Service GmbH does not assume any liability for damage caused through the passengers own fault or the fault of other passengers. The liability is generally limited to EUR1,000.00 for material damage incl. luggage and EUR500,000.00 for personal injuries. The maximum is adapted to any higher statutory limits, as may arise, in case these are increased or changed. In the interest of traffic safety the following statutory regulations must be complied with and insofar these concern the customer by him as well and the passengers must be informed accordingly. a./ The mere driving time, time behind the steering wheel, must not exceed nine hours. b./ The driver must take a break of at least 45 minutes after a ride of 4.5 hours. During the break the driver may leave and lock the bus. c./ On journeys with two drivers the maximum driving time is 20 hours, i.e. ten hours per driver. The provisions regarding breaks shall apply accordingly. d./ The driver must have a rest period of 11 hours each day. For this purpose a proper sleeping space must be made available. Proper does not mean a tent or any room exposed to noise or space on the bus. e./ For several-days trips please note that the two-week driving time must not exceed 90 hours and that the driver may not drive or work for more than 12 consecutive days. He must then take at least one full day off. f./ For several-days trips the driver must have a proper sleeping space, that is a single room with proper washing facility and board (three meals a day) must be available. The cost shall be fully borne by the customer. g./ The driver is hired for the driving. During the breaks he must not be on-call, for instance to supervise the luggage or clothing but shall lock the bus and can dispose freely of his time. The customer shall inform the passengers of the terms of business. The customer shall name a responsible person who shall serve as the contact for the driver during the trip. The transportation contract is considered legally effective if the customer does not contradict the order confirmation immediately or in advance by phone in cases of urgency. Any disputes arising from this transportation contract, the driving instructions or these terms of business shall be settled before a competent court in Düsseldorf. All prices are quoted excl. VAT unless indicated otherwise. Any changes of the VAT rate either in Germany or abroad, any other tax changes, an increase in fuel prices of more than 5 per cent from the time of placing the order or any other substantial changes in the general conditions constituting the basis of the order entitle Nordrhein Reise und Bus-Service GmbH to amend the agreed fare. German VAT is only levied on the German part of the route as long as there are no deviating tax regulations.